NES Super Mario Bros. (JPN/USA) "warpless" in 18:38.22 by HappyLee. It is a 3.48 second improvement over the previous movie by the same author, HappyLee. 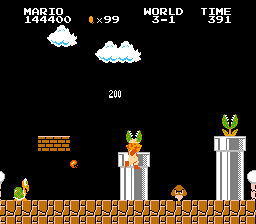 Most of the improvement comes from new instances of glitches that make Mario decide to ignore the castle and instead rub sensually against the flag pole's support. For more information, you can read the author's comments. You can see this movie played back on an actual NES here!